Ah! The end of the A to Z series! Well it has been a fun way to showcase some excellent albums here, hope those of you who come here (and never comment) enjoyed it. I haven't decided if I should start up a new series theme or just start posting whatever. Something will happen though. So I probably have somewhere around like 14 Robbie Basho records. If you don't know Robbie Basho...think John Fahey but even more psychedelic. If you don't know John Fahey, well, what gives? It's finger-picked acoustic guitar most of the time. Sort of "western" ragas, but Basho's music is very much influenced by Persia and the east and almost always has been. Basho also has a tendency to throw in drums and piano and even sing on a lot of his records, which all come around on this album from 1974. 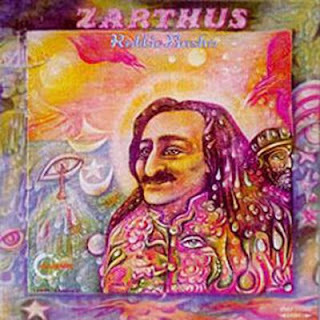 Many Basho fans regard Zarthus as is his best album, I don't know if I do. It's great, it's crazy, and it features one epic track in the 20-minute "Rhapsody in Druz" but I don't always like when he sings. His voice is real deep and not bad, but his guitar work is so amazing, I would usually just rather he does that. It's a good to great psychedelic record regardless though, so you should probably get it. Robbie Basho's Zarthus, dating from 1974, is, in his own words, "An album of Persian, Arabic, Westerns Themes (sic), woven together into a single 'Fabric D'Amour' to cover the barren manekin (sic) of modern times." Easily the album that most indulges his obsessions with Eastern modal scales and odd meters, and even Western classical themes. All of it is grounded in Basho's guitar though, and the discs first two tracks, "Zarthus" (dedicated to Meher Baba, Pete Townshend's guru) and "Khoda é Gul é Abe," are driving 12-string numbers, possessed as much by the rhythm of the mridingham as they are by Basho's trademark open tonal wandering up and down the fret board. There is some single string playing in "Zarthus," but both tunes are overdriven from the fluid, liquidy percussive strum and drag of his lightning quick right hand. On "Mehera" and "Khalil Gibran," Basho employs the use of a piano as well as his guitars and his voice. For those who were put off by the singing on Voice of the Eagle, this is easier to handle, melodic and true if oddly constructed. All of it is based on drones and the cascading up and down is limited in range. The poetry in his lyrics is spiritually beautiful. The album's capper is the 19-plus minute "Rhapsody in Druz." The first half is a beautiful love song to a spiritual master, and the last half is an exercise in droning strings, both on the piano and the guitars, rumbling microtonally against one another in tandem and causing overtonal vibrations between them. While this is not Basho's finest recorded moment, it is certainly a very good one, and all fans of the development of his music should take notes of its compositions as well as of his truly innovative piano playing.